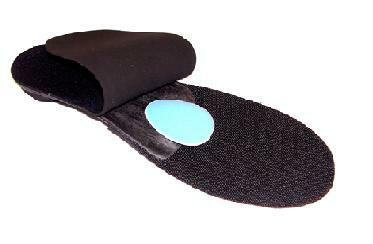 Biotech Orthotic Design | Elmsdale Nova Scotia | Custom Orthotics — Hold The Glue! It can be challenging at times to get accommodations such as met pads or neuroma pads in exactly the right spot without the patient’s feedback. Diagrams, pedographs and instruction can come up short dynamically with footwear influences in certain cases. Missing the mark just slightly can result in discomfort or reduced results for your patients. The next time you send in an order and find yourself concerned about the accommodation placement you may want to consider this option. Request the front half of the top cover be left unglued, this way you can reposition the accommodation and or try different sizes and thicknesses with you patient there. Have your patient try them in their shoes and get their feedback. The additional information will help zero in on that perfect position ensuring satisfaction. Once the placement is established glue the rest of the top cover down or return it to the lab for completion. On the work order simply request under “Additional Instructions” “Do not glue front of top cover down” This effective method of accommodation placement is a great option for unusual placements that may be difficult to articulate on your work orders.